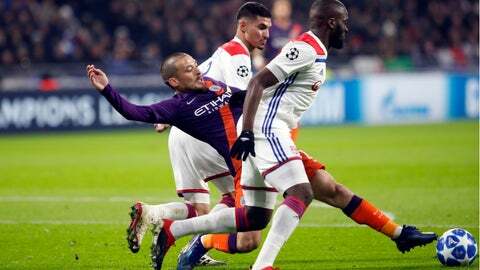 “People say the French league is just PSG, but they are so wrong,” the Manchester City manager said after Lyon midfielders Houssem Aouar and Tanguy Ndombele left an indelible mark on his mind. Against the Premier League champions, both players won more than 80 percent of their duels and suffocated City’s attacks by cutting off passes and forward runs. Ndombele also created danger with his passing quality while Aouar set the match tempo. Ndombele, who played in the fifth division only two years ago, has been on a meteoric ascent since joining Lyon from Amiens on the final day of the transfer window in August 2017. Praised for his versatile talent and compared with former Chelsea midfielder Michael Essien, he was called up by France coach Didider Deschamps for the first time in October. He made his international debut against Iceland in a friendly. Ndombele’s fine performances have ignited interest from top European clubs, with City reportedly offering 50 million euros ($57 million) for his services. Lyon president Jean-Michel Aulas refused the offer but recently said in an interview with Lyon newspaper Le Progres that he could not guarantee he would be able to keep both Ndombele and Aouar at the club. Guardiola said Aouar, who reportedly turned down a move to Liverpool in the offseason, has a bright future, too. Nurturing stars has always been a tradition at Lyon, and Aouar is the latest talent to emerge from the club’s renowned youth academy. The attacking midfielder, who is under contract with the seven-time French champions until 2023, started 27 league games and scored six goals last season. He built on the momentum and has already produced five goals and one assist in 14 games ahead of Saturday’s trip to Lille. Against City, he read attacking moves easily and displayed impressive technical skills at the same time. “I started training with the pros two years ago,” Aouar said. “Lyon already had a young squad at the time, not quite as young as this year, but there were still a lot of young players, players from the youth team. I was lucky, I got a lot of help. Alexandre Lacazette took me under his wing. Aouar, who has been given the No. 8 shirt previously worn by Lyon great Juninho, is a member of the France under-21 team but has all the qualities required to quickly join Ndombele in the senior squad.